...this year certainly is! I feel as though I'm doing a swift jog to keep up. Sometimes you just have to take a minute to slow down and smell the flowers, so here I am with a Flowery First Of The Month post. It all started on a summers day at Flower School. I was learning about floral foam, you know the green stuff that you stick flowers into. For some reason watermelon popped into my brain, no -not because I was hungry, but because it has a similar consistency to the foam and it holds water (juice). The fact that it is a wonderful pink colour that is complimentary to both bright or pastel flower colours was an added bonus. So before I was lead astray by other ideas, I raced off to the fruit shop and bought some watermelon. I took it home and gleefully like a crazy flower lady, shoved flower stems into it. My idea worked a treat!! I've used different flowers over the years. Gerberas add happy colour, Birds of Paradise and Orchids are great for creating a tropical display, even green leaves used artfully look fresh and fun. Today I started with some electric pink zinnias from my garden. 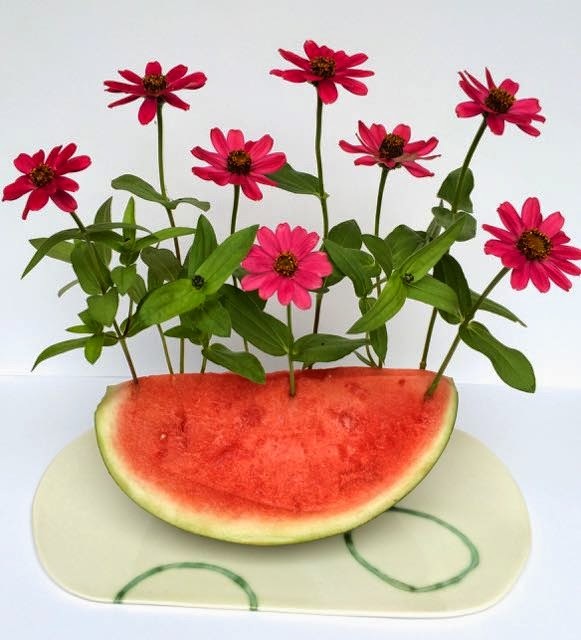 The longevity of the flowers differs according to the different varieties, and other factors such as the ripeness of the watermelon, and heat of the room. I find they usually last about a day though I once had some gerberas last 4 days. It's more a style of arranging that's best suited for a party, a function or an afternoon of creative fun. You can use the watermelon as little wedges. Picture a row of watermelon triangles on banana leaves running down the center of a long table, with abundant orchids arranged proudly in different colours. to feature a single beautiful bloom. For something different I tried it with a kiwi fruit. The result made me laugh, they look so cute and comical. Wishing everyone a fun, frivolous and fruity March. Oh Rachael, you make me laugh! What a fun idea! These images will have smiling all day! What a hoot! Who would have thought fruit and flowers but it's delightful. You are so creative. I started smiling when I read your post, a clever idea as the flowers would get moisture from the fruit. I wonder if it would work with a whole watermelon as well, of course you would have to poke holes in it to get through the skin. Cherry Zinnias are one of my favorite summertime flowers. :) Who would have guessed they would look so cute in a watermelon! Haha, I love this. I hope I can remember this for our 4th July. I am picturing daisies and little flags stuck in Watermelon. Thanks for such a cute idea! Such fun! I love them all. I MUST try to do something similar. Hope you got to eat a slice of watermelon too. A great way to think outside the box! Or foam, in this case. 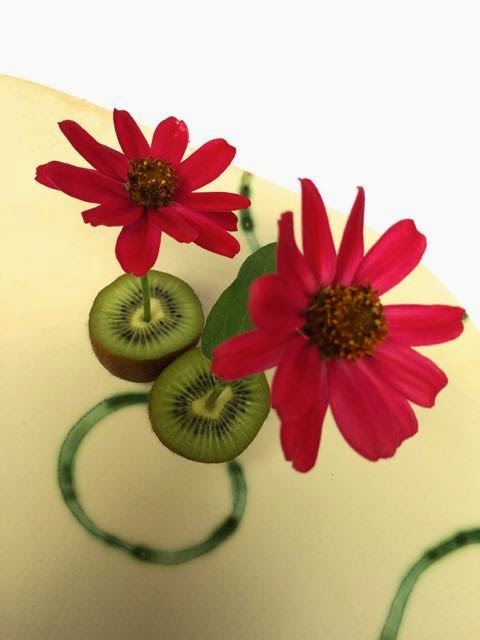 The kiwi makes such a whimsical statement too! 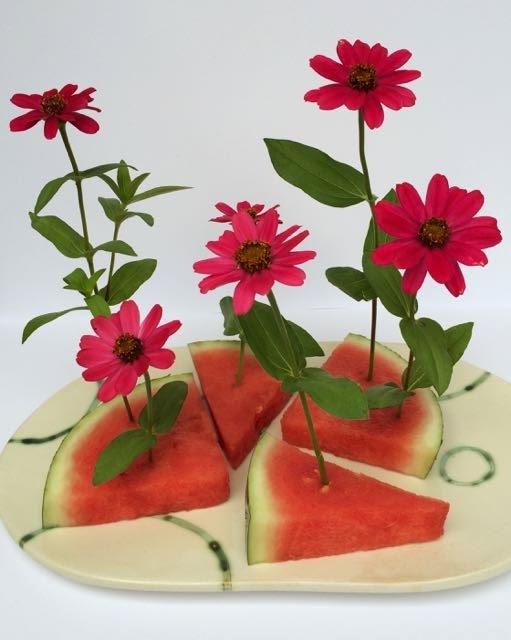 Just imagine white and blue daisies in a slice of watermelon! The though t is delicious! Brilliant idea!! You're enjoying this aren't you. Nothing like watermelon on a hot day. They look great, so cheerful. 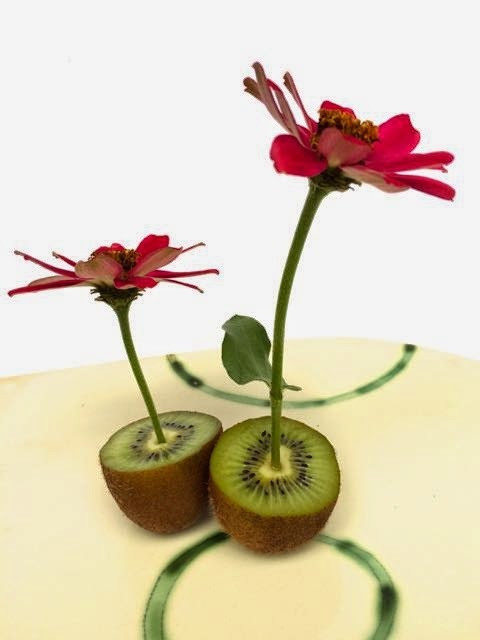 You do have such a creative mind Rachael, but I'd be wanting to eat the fruit instead of poking flowers into it - although with the right flowers I guess you could do both. HeHe... so fun dear Rachael! To that I would add and so delish! HA!!! who wouldn't smile seeing this as a centerpiece! that's just FUN!!! You are clever & creative, Crazy Flower Lady! Rachael, when I first saw the link to your post I thought you had stitched the zinnia in wool! 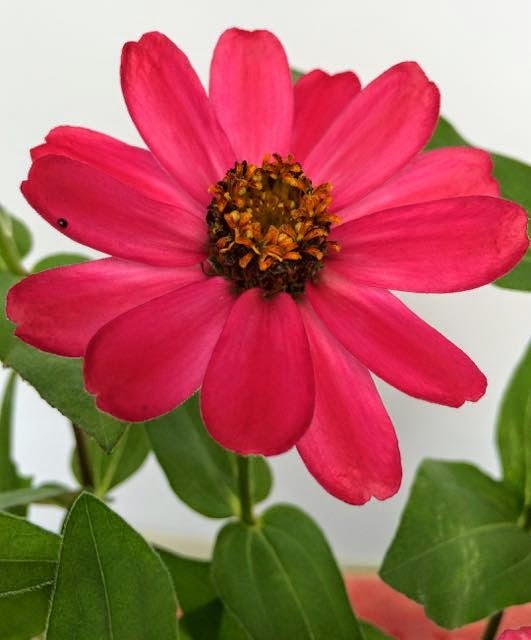 But now is see it as an actual photograph of the Zinnia. What a creative idea for displaying the flowers. What a great idea! The kiwi fruit do look so funny. 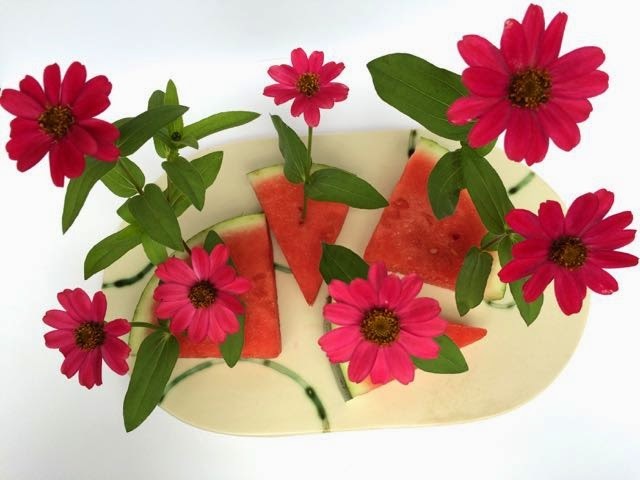 Your post today made me want flowers, especially those hot pink zinnias and watermelon. What an awesome idea! I do like this fun idea. I will never see watermelon in the same way. I do think the arrangements look great. Thank you for such a lovely idea. I love it! 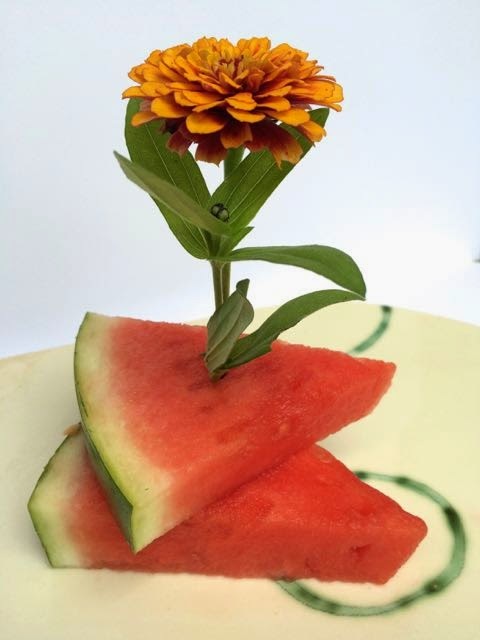 But now my mouth is watering for watermelon - it would never last long enough around here to get flowers! So pretty. It's going to be a while before juicy fruit are around here but we are getting flowers! That is so beautifully quirky. I love it!! Rachael, sorry this comment is not in relation to this post but I can't seem to email you. Wondering where to find a photo of your finished Sis Boom hexagon quilt? Thanks! Oh my goodness! How funny! I seem to remember putting cut flowers into colored water and changing the color of the flower petals. The fruit is a fun idea and eco friendly! What a great idea brilliant. What a fun, natural way to display flowers. Personally I love the kiwi holders best! guess you make lots of folks laugh...good...very good...laughing is a wonderful idea...unfortunately, you make us hungry too...like the watermelon.. Watermelon festival is not until July in Charlotte..so I guess I will have to wait. Enjoyed your post, Rachel. LOL - but I'd eat the fruit before I got flowers in there. Those are two of my favorite fruits. You're hysterical! This comes under the heading "Who thinks this stuff up" LOL. What an adorable idea! The possibilities are endless! this. 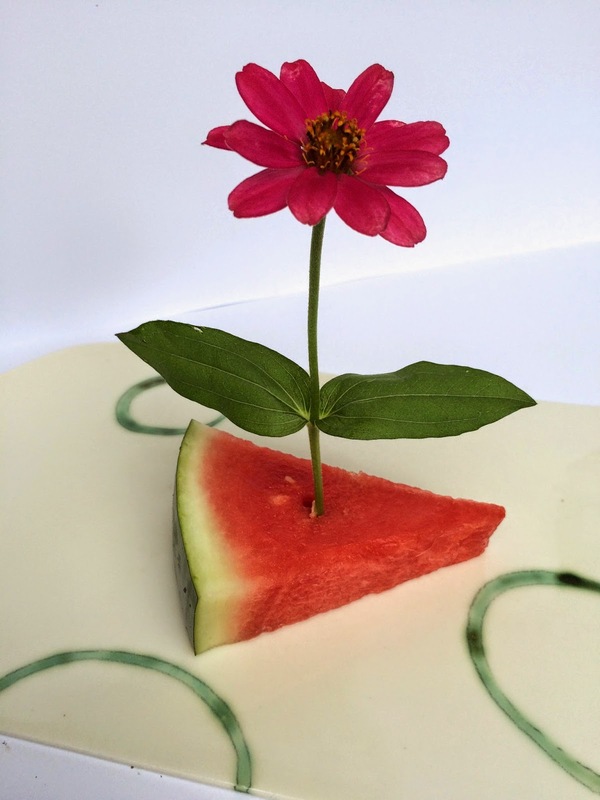 The best use for watermelon and have you tried other melons, like orange and yellow ones? This is VERY FUN. Thanks. How cool! At least watermelon has one useful purpose! I loathe watermelon. I was sick once when I was a kid not long after I had eaten watermelon and yeah I know it wasn't the watermelon that was the problem but it has put me off it for life. I love your ingenuity. That is one of the cutest, most unique things I've seen in a while! what a great and creative idea! 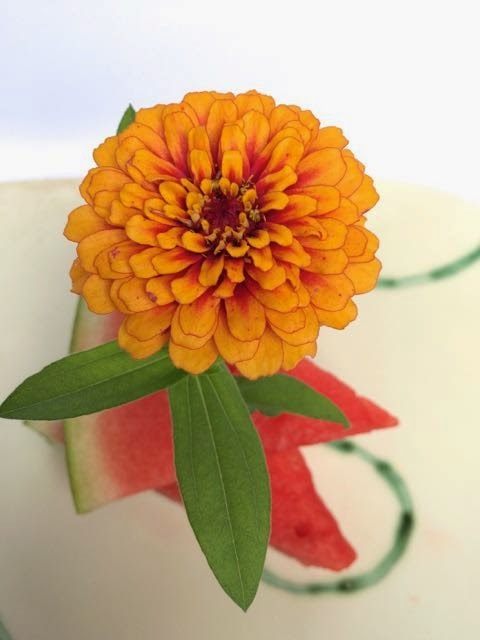 fruit and flowers, a natural combination! Such a cool post RAchael...love it! So, SO fun! Thank you for the bright opening to my Monday morning.